Brazos Valley Schools Credit Union, in partnership with Katy ISD, will honor outstanding teachers from each campus who have demonstrated excellence and leadership among their peers and in their classrooms at the 2019 “Teacher of the Year” luncheon on April 18th at the Merrell Center. This high-profile event will offer sponsors a fantastic opportunity to showcase their business to the community as we continue the long-standing tradition of honoring the Teacher of the Year winners from all 68 KISD campuses. We are seeking sponsors to help support this event and are offering several levels of participation for area businesses. All sponsorship money will go toward hosting the Teacher Luncheon and providing gifts for the winning recipients at each campus. What better way to promote your business, support education and spend quality time with local businesses, community leaders and prominent members of the community? 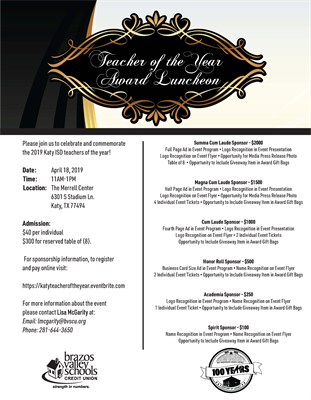 Please consider participating in the Katy ISD 2019 Teacher of the Year Luncheon with BVSCU. 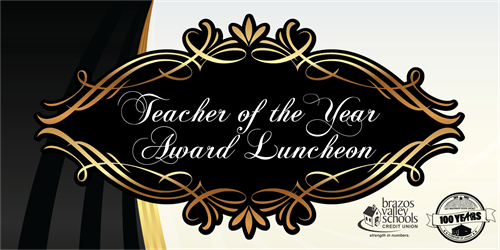 For more information about the 2019 “Teacher of the Year” luncheon, please visit https://katyteacheroftheyear.eventbrite.com or contact Lisa McGarity at 281-644-3650.